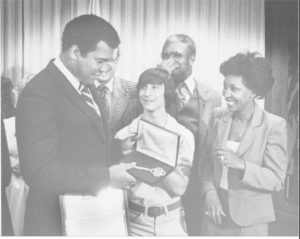 Ethan Marten re-presents the key to the city of Sacramento to Muhammad Ali as then City Councilwoman Maxine Waters looks on with great amusement. I was writing for the American River College weekly school newspaper, “The Beaver.” There was a press conference with Muhammad Ali, and California’s Lieutenant Governor Michael Curb. He was giving Ali the key to the city in the morning…. After the conference, when all the press had cleared (except me; I was a starving student, and there was still food on the tables! As ravenous as media folks are – this should have been an indication I was headed into acting right then and there!! ), I noticed the key sitting on Ali’s table with the dirty dishes. I laughed, called my photojournalism teacher (Michael S. Williamson, who ended up winning a Pulitzer or two), and asked him if he would meet me at the state capitol. I was going to represent the key to Ali. He laughed; “Only you, Ethan.” We reconnoitered in the governor’s office! We gathered with future CA Congresswoman Maxine Waters (we knew each other from my time covering city council beat), and she led me before the gaggle, to the front of Jerry Brown’s office for the honors. I had met Ali a few times before this in NY, and he was funny, a showman for sure, and actually very kind. I flashed him the key so he knew what was coming. There was a roar of laughter, from the press core. Ali started blushing. I “re-presented” it on behalf of the fair city of Sacramento, because The Greatest deserved to have at least two ceremonies so that it would be memorable enough to remember to bring the key home. He didn’t miss a beat; “I left it on purpose, because I found out it wasn’t real gold…I’ll make sure to take it with me this time.” He told me if I were 6 foot, I would have been in trouble. I responded with, “you’re fast champ, but not that fast.” Then I got to hang with him, Jerry Brown, Willie Brown, and Maxine Waters. Michael ran off to make deadline. Very memorable day! Ali just kept shaking his head and laughing. Thank you for capturing this memory Michael, and for so many more serious works. You were a great teacher, by the way, and I use those lessons in composing shots for film to this day.